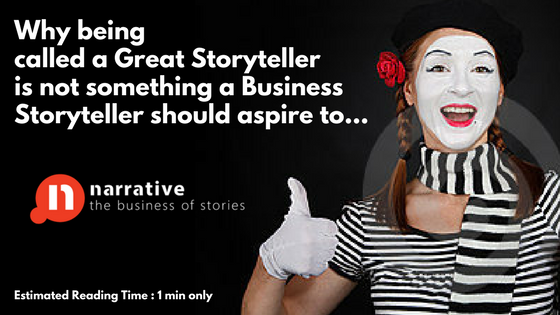 Home · Business Storytelling · Storytelling : Why being called a Great Storyteller is not our goal.. I give talks on Storytelling regularly and sometimes I am introduced as a Master Storyteller. I often grind my teeth when I hear that because if I am called a Master Storyteller, then I have actually failed as a Business Storyteller. The idea here is that unlike in Performance Arts Storytelling where we are really trying to draw attention towards the performer and performance, in business storytelling the attention should be on the message not on the person telling it. Paul Smith explains this wonderfully in his book Sell with a Story . But the same compliment in Business Setting doesn’t work. If your audience are so engaged in your performance most likely they are not engaged in your message or the point you are trying to make. In essence, even though it feels great to get compliments… perhaps not this one. Our Storytelling Workshops are not about making you a great performer but making you a great communicator whose messages lead to desired action. Deep Work : Who will thrive ? Product Storytelling: We have it all covered..